There’s a movie that came out in 2001 called, “Life as a House.” It was pretty terrible, I wouldn’t recommend watching it to my family or friends. (Hayden Christensen was one of the main actors, and I never liked him in anything he has acted.) The movie is about an architect named George who was diagnosed with terminal cancer, and he tries to make the most of the rest of his life before he dies. He reforges his relationship with his son (Christensen), and manages to pull Christensen out of a dark hole by being a father and being present in his life again. That element of the story is redeeming, but it was still a bad movie. That is what the past several years have felt like as a young professional for me, looking back at them. Slow, steady change that I didn’t even realize was slowly happening until I looked back. I’m still chasing my dream of becoming a licensed architect. After working for six years in the field, I’ve left my job and gone back to graduate school to earn my Master’s in Architecture degree so I can gain my professional license. I’ve spent the past six years since the summer of 2009 learning about professional practice, how buildings are constructed, and how a set of construction drawings go together as a set. I left college with a non-accredited undergraduate degree, undeveloped skills, and a thirst to work because I hadn’t learned what I wanted in my undergraduate education. I worked in designing schools for almost three years, then designed an industrial factory for about nine months, then was designing Panera Bread restaurants for almost two years. It was good for me to be working, and I was having fun. To relate it back to film, I’ve felt like my undergraduate education compared to myself now in graduate school is more like Steve Rogers (played by actor Chris Evans) in Captain America: The First Avenger (2011) with pre-serum and post-serum. Pre-Serum J.T. was dragging his architecture model in the mud, just barely getting by in school. Now that I’ve been working for a while, going back to school has been a big change. Now I’m ready to destroy Hydra tanks. Watch out, Red Skull. Captain J.T. is here! for it is a tale worth telling once more. His name I cannot recall. It doesn’t matter much, truly, above all. for he knew they were lost. and gave the Guile all of her trust. Myrtle didn’t eat that night. from the stranger she met. but his name I cannot recall. one another their helping hand. will be, when we get old with glory. and she smiled with a pause. and I needed not a name. “I am Myrtle,” she said with love. with his big suspicious blue eye. so I gave him a guile smile. Myrtle a very small tug. a whole lot about money. he wanted to talk about was love. left my head a groaning. I don’t know what Myrtle and Myrtle said. this old couple would have to go. she’ll be easy as pie. his shell was limp, tail and all. My Myrtle was gone out for a roam. Old Other Turtle said in his jaws. in my neck I heard a loud pop. My arms went limp, my legs went limp, my tail went limp. I could feel them not. was all she could cry. AND YOUR WIFE OF YOUNG. he said with a spit. and that was when Myrtle turned on me. she said with a tear. She shook with hard cries. that kept them together so long. She sobbed with new tears. “Of course, my dear, of course you can. I asked her with a small smile. She looked at me with eyes anew. so shall I always keep you. She goes out at night, finds food for us both. Brings it home by morning to rest. She feeds me, helps me to eat. so each day passes, without a single protest. we share times of old. I need her so much. It’s been almost two years since I’ve written on here. I promise I’m still alive. I wonder if anyone still reads what I write. My buddy Aaron gave me a gift last week. I’m trying to get back into shape, and I’ve starting running again. My junior and senior year of high school, I worked out five days a week in the mornings before school. I felt great when I graduated, I had so much energy, and I was proud of how my body looked. In college, I exercised less as I worked so hard on my architectural undergraduate degree, even though I found new activities that I loved such as rock climbing (both at the plastic rock wall and real cliffs), backpack hiking, and being out on a canoe or kayak. Anyway, Aaron’s gift for me was a iPhone arm band case and the shoe clip and the Nike Plus chip for the Nike Plus running program. I really appreciate his encouragement and helping me get back into shape. Trying to think of something nice to do in return, I decided to write him a nice thank you note, but the only thing that came to mind was the story of the Tortoise and the Hare. I used some of the watercolor cards that I have had for ages and painted for the first time in five years. I had fun, and I’m going to do it again soon. Thanks, Aaron, for believing in me. The Owner called with a problem with the doors. First it was getting the door hardware installed on the job - hardware that must be programmed for multiple users to have access into the school with complex software- and now it’s the closure mechanism. The problem is that the form of the door pull has to meet ADA requirements (it looks like a “C” form in shape with a required certain depth before it returns flush with the surface of the door and the key hole has to be inside that form to comply) but for the closer to hold the door open, you have to push the door open beyond 90 degrees to activate the mechanism that holds the door open. We didn’t design for that space, 4″ depth for the hardware. When the doors are fully open, the pulls knock into each other. In order for the doors to be held open, you have to push the door beyond 90 for the closure to click and activate. We can’t do that in all instances of our brand new building because that consideration was skipped in the design process. One door can hold open at a time, but we lack 8″ for both doors to remain open at one time. we’ve been put together by God above. even when they are poorly spoke. my love language of time spent near. I hope they overflow your cup. “I could never be happier,” I truly said. Our adventures together stride by stride. a wild party we must hold! that others see and we behold. I went to architecture school for for years; graduated with a bachelor of arts in architecture degree. I am apprenticing in a firm to earn my intern development program credits (IDP); I will return to graduate school to get my master’s degree in architecture. I will complete my IDP and start taking 7 architect’s registration exams (AREs). I will gain my license to practice architecture. I will participate in continuing education credits and attend seminars to stay up to date with my profession. I will become a project manager. At times it feels frustratingly overwhelming how much I feel I don’t know. My employer gave a very interesting dialogue today of the paperwork that our firm fills out during the design development process of our educational jobs, and it was really interesting to me; within a few hours he had me transcribing marks on payout forms from a general contractor, discussing how he determines and evaluates how much to give builders. On a current project that we have in the office, the construction manager (CM) provided us with a design development cost estimate, and I had no idea how the monetary figure was determined for rough carpentry - and had to look at a specification to see what was included in the woods section. These are new things that I didn’t receive exposure to in school and feel completely inexperienced. At the same time, I’m learning so much. In just over one year, I can see a tremendous change in myself. I’m learning to listen - and not just “hear” people. I’m getting better at not interrupting people while they speak - and it’s amazing what I’ve missed for so long. I’m seeking to see patterns in the needs of my employers, so I can better aid them and make their jobs easier. I’ve been asked to take on more responsibilities at work: I’m now the webmaster of our website, and I’m assisting in promotional projects like adding our company a page on facebook. I’m learning how to read a set of documents to answer questions about the building’s existing conditions and verify construction progress to a set of contract documents. I’m learning to draw in more detail than I ever did in undergrad- and compose a set of documents in a beautiful, artistic, and logical way. I’m seeking to be more thorough in quality control of the document review process. My vocabulary is expanding. My 3D vision is becoming more fine tuned. I’m interested in flashing details and issues of environmental controls. I think architecture is what I want to make not only my job, but also my long term career. 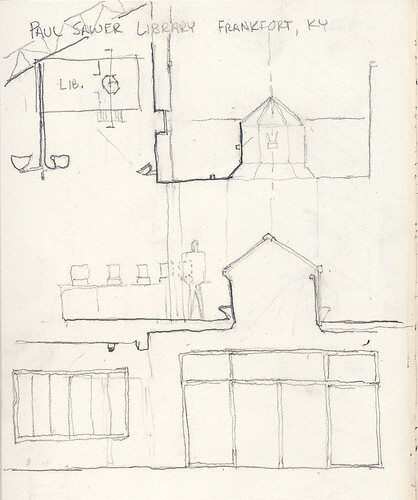 This is a quick section sketch I did of the Paul Sawier public library in Frankfort, KY. I need to go out sketching more to practice those hand muscles, because I felt clumsy and uncertain of myself at this first documentation sketch I’ve made in several weeks. My section doesn’t capture this well enough to my liking, but as you go in the primary entrance to the library, you enter a wall of 4″ deep display casework with sliding glass doors, and then enter a hollow metal door frame with transom light to enter the circulation area. Above that entrance, the ceiling rises to 18″ higher, and you can see an 8 sided lantern that looks into a second 8 sided lantern above you, and from that you can see the sky above. I went up to the second floor (children’s wing) and stood at the large glass lantern, looking down into the space where I had just stood at the entrance. I then looked up, and out to the sky - and saw that there are side walls outside of the second lantern that conceal roof conditions (stucco with a metal edge trim around the top). One the second floor, a column separates some computer spaces lit by a chandelier, and a open web truss carries the roof load down to the exterior wall on a slant. Looking at my drawing, I needed to make some small thumbnail sketches before I started to describe what I wanted to say graphically. I also missed the entrance foyer hallway and the steps down to grade, which really accents this vertical relationship that I’m trying to show. I need to go and draw it again. My paper looks yellow in my scanned image, yet my acid-free paper in my sketchbook is white. I will look at the scanner settings before I try to post another sketch. Any tips or advise how to make this look better? There is also a little bit of the scan from my previous page visible in the top right corner, so perhaps I need to start my next sketch on a clean page front and back to prevent this from happening. Architecture+Faith © 2007 All Rights Reserved.